As a husband, you want to be all your wife desires. You want to love her in a way that lives up to her expectations. And you will--with these ready answers to your questions about how to really love her. What does your wife long to hear from you? How can you prove to her that she is your number one priority? How can you meet both her needs and yours? What makes you a hero in your wife's eyes? What is your wife saying when she doesn't speak? 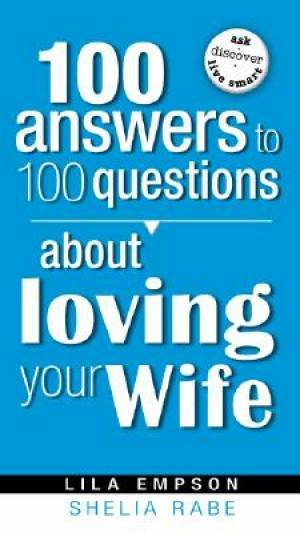 100 Answers to 100 Questions About Loving Your Wife gives you the quick and clear answers you're looking for. It's a resource you can rely on for a long and satisfying marriage. 100 Answers To 100 Questions About Loving Your Wife by Lila Empson; Shelia Rabe was published by Charisma House in August 2008 and is our 69992nd best seller. The ISBN for 100 Answers To 100 Questions About Loving Your Wife is 9781599792774. Be the first to review 100 Answers To 100 Questions About Loving Your Wife! Got a question? No problem! Just click here to ask us about 100 Answers To 100 Questions About Loving Your Wife.